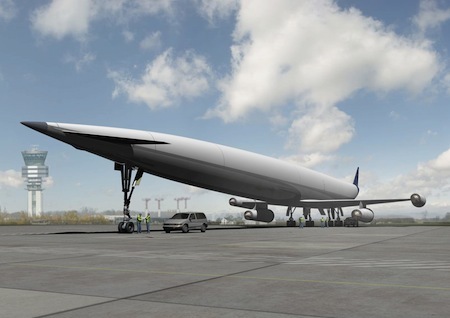 SKYLON is an unpiloted, reusable spaceplane intended to provide reliable, responsive and cost effective access to space. Currently in early development phase, the vehicle will be capable of transporting 15 tonnes of cargo into space. It is the use of SABRE’s combined air-breathing and rocket cycles that enables a vehicle that can take off from a runway, fly direct to earth orbit and return for a runway landing, just like an aircraft. (Credit: Reaction Engines)"
"The Rocketplane referred to, is to be called the Lapcat. " "Lapcat? What a crappy name, they should have named it after something from the movies. SpaceX already took the word "Falcon", maybe they could just name this "Millenium"? : /"
"It turns out that Lapcat is a (not very well chosen) acronym: LAPCAT (Long-Term Advanced Propulsion Concepts and Technologies). The idea formed the basis of a 36-month European study to examine ways to produce engines for a Mach 4-8 hypersonic aircraft. The project ended in April 2008. The prototype pictures were pretty cool, though. Take a look.